Theology and Society is the most comprehensive study of Islamic intellectual and religious history, focusing on Muslim theology. With its emphasis on the eighth and ninth centuries CE, it remains the most detailed study of scholarly networks in the early phase of the formation of Islam. Originally published in German between 1991 and 1995, Theology and Society is a monument of scholarship and a unique scholarly enterprise which has stood the test of the time as an unparalleled reference work. 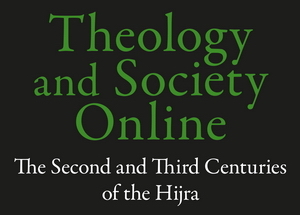 In this online version of Theology and Society the lay-out of the text differs slightly from the original, German, print version. The original texts include notes, asides, and bibliographical information which were typeset in a smaller font and in indented text blocks. In the online version these notes, asides, and bibliographical information are rendered in brown text blocks without any indents.